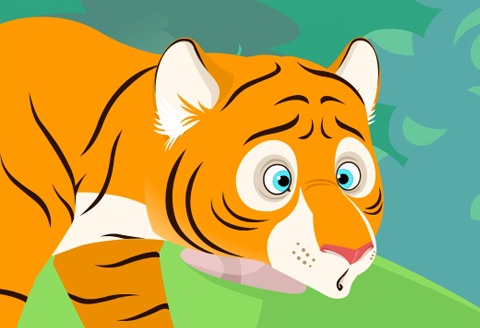 Made with EDAP Tools: Animal Alphabet Animal Alphabet is an animated series for young children. The title sequence (as well as many of the episodes) are animated in Flash CS6, powered by EDAP Tools - the tools of the animation professional. Intro to Smart Magnet Rigs Demonstrates what Smart Transform and Smart Magnet Joint do; how you can use them during animation for quick and flawless posing. Smart Graphic Control Interactive visual Timeline control of Graphic Symbols. Automatic Keyframe generation and much more... Coming soon to EDAP Tools v.4! KineFlex (SMR Tool) An extremely powerful tool which allows precise quick posing, utilizing the available hierarchical structure of a Smart Magnet Rig. Creates on-the-fly temporary bone chains according to a forward kinematic model. 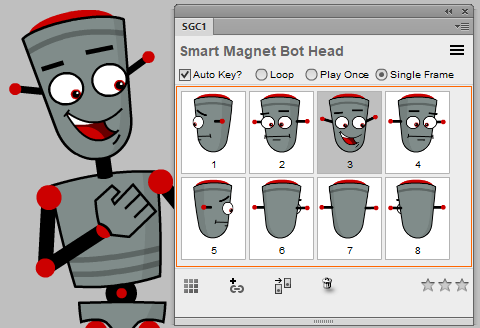 Smart Magnet Rigging Part I How actual characters are put together: Reg points, Magnet Targets, Center Markers, Smart Magnet Rig panel, Create Magnet Target, Smart Transform and Smart Magnet Joint. Made with EDAP Tools: Le Carousel This song is a part of the French course of Languages Online App. 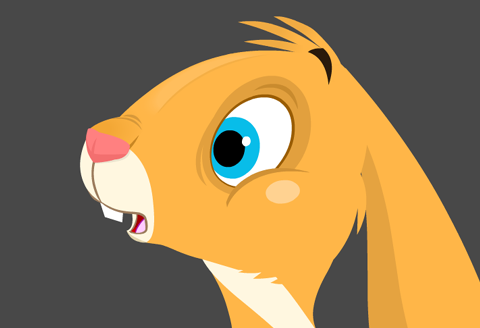 All work was done in Flash CS6, enhanced by EDAP Tools - the tools of the professional animator. Smart Magnet Rigging Part II Converting an existing character build into a Smart Magnet Rig. Advanced techniques. MTs, CMs, Smart Magnet Rig panel, SMR Commands. Smart Magnet Rigging Basics Introduces Magnet Targets and Smart Magnet Rig panel, metadata IDs so that you can start using Smart Transform and Smart Magnet Joint. An extremely powerful tool which allows precise quick posing, utilizing the available hierarchical structure of a Smart Magnet Rig. KineFlex appears in the tools palette next to or below Free Transform (Q) tool. Interactive panel which allows users to create Thumbnails for each frame of the content of a Graphic Symbol and then to control the 'looping' setting and 'first frame' for a particular Symbol Instance, by clicking on the desired thumbnail. 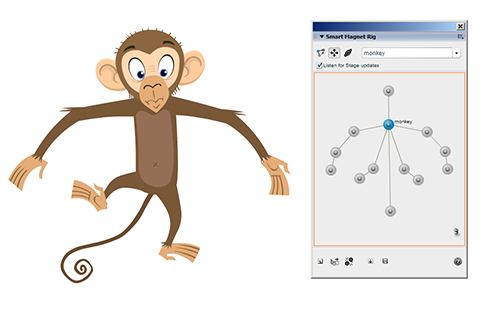 Creates a zigzag ‘stagger’ custom ease graph between two keys in a Classic tween. 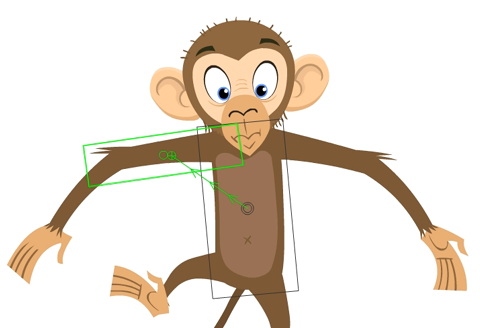 Positions anchor points precisely at frames and offers a choice of several presets, which can later be tweaked by the animators to better suit their needs. Finds and replaces stroke properties across all shapes in the current document. Allows to process Thickness, Color, Alpha and Style separately or in any combination. 'Cleans up' broken arcs in Classic Tweens, by auto-keying every frame and snapping elements to their Magnet Targets (MT). Suggested use: When we need to quickly and efficiently clean up a limb, broken during rotation. Nests a block of frames inside a Graphic Symbol container (to preserve it) and then converts it to a sequence of single frame Movie Clips. Suggested use: The only way to apply a filter to animation, but also keep it 'exportable' is to convert each frame to a Movie Clip. Enter only. Symbol is entered for editing at the currently displayed (key)frame. Punch only. Symbol is 'punched' i.e. the current frame of a Symbol's entire Timeline is converted to keys from the outside. Converts selected frames to Keyframes. Feature-rich complete replacement of the standard F6 (Convert to Keyframes) behavior. Convert To Keyframe Advanced now preserves simple and custom easing in existing Classic Tweens. Smart Transform only works when rigs have been build using Magnet Targets and hierarchies have been established via Smart Magnet Rig panel. Smart Transform allows chain selection of elements for transformation based on forward or inverse model. Upon execution the command repositions the selected (children) Symbol(s) matching their Registration points to the registration points of a Magnet Target present in a parent symbol. Adding of Prefix and/or Suffix, Trimming the names of Library items, Finding and Replacing specific characters. Allows adding sequential numbering to the names of Library items as well as basing those names on the names of containing folders. Suggested use: To quickly and easily enumerate (rename) multiple Library items. Displays the next / previous frame of the internal Timeline of the currently selected Graphic Symbol(s) or moves the playback head (jumps) to the next / prevoius Keyframe on the currently active layer. Smart Transform Point CCW cycles the Transformation point of multiple selected symbols to the left (counter clock-wise). Smart Transform Point CW cycles the Transformation point of multiple selected symbols to the right (clock-wise). Tog­gles out­line mode or guides (hides) the selected layer(s). Suggested use: For quick access to outline mode from the keyboard when needed. Swaps multiple Symbols. Suggested use: Allows swapping of multiple selected Symbols on Stage with one currently selected Symbol in the Library. Creates two types of invisible objects (and layers for them), necessary for the functioning of Smart Magnet Joint and Smart Transform. 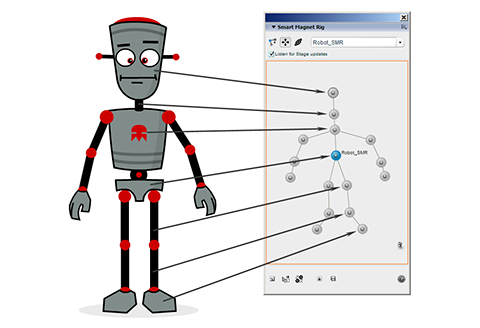 Interactive panel through which users are able to visually establish the hierarchical structures for the Smart Magnet Builds and link Symbols in parent-children relationships.